1840 Inter-Island entire from Peel to Douglas showing a SUPERB BOXED PEELTOWN/ISLE OF MAN on the reverse and with, on the front, a MS 'P1' in red. IM 40, W 445. 1813 Entire from Castletown, I.O.M. 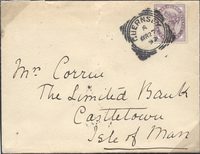 addressed to Whitehaven showing a SUPERB STRAIGHT LINE ISLE OF MAN, IM 6, W5, MS 4, 41 x 4 mm. 1840 May 16th Entire from Henry Holmes in Liverpool to his BROTHER JAMES IN THE I. O. MAN CARRIED PRIVATELY - INTERESTING ENDORSEMENT ON THE REVERSE, "IF I CAN WILL GET SOME 2d QUEENS HEADS THIS MnG". No 1840 2d Blues had been sent to the IOM at this time and none are recorded used in the island! 1834 Entire from Liverpool addressed to "Col. Ready Governor of the Isle of Man, Castle Rushen", charged '10' in manuscript. NO POSTAL MARKINGS BUT MANUSCRIPT "L.POOL" on the reverse. 1840 Entire from William Farrant to his mother at Jurby, IOM - William was at The Crescent Academy - showing a fine -DOUGLAS-/ISLE-OF-MAN cds, IM 30, W 28. 1813 Entire to Dublin showing a very fine straight line ISLE OF MAN, IM 6 (similar) W 5 and a Dublin Mermaid datestamp. 1843 Inter-island entire from Castletown to Douglas showing a fine ISLE-OF-MAN circular datestamp. 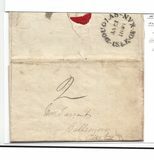 1843 Entire to Douglas with, on the reverse, a fair CASTLETOWN-ISLE-OF-MAN undated circle and a fine circular datestamp, IM 26. 1783 Entire from Peel addressed to Unerigg, Cumberland showing a fine two-line ISLE OF/MAN, IM 2 (W 2). VERY SCARCE. 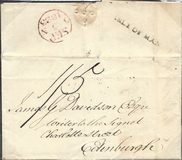 1842 1d Pink Envelope to London cancelled by a very fine ISLE-OF-MAN MALTESE CROSS. 1823 Entire to Edinburgh showing on the reverse a very fine straight line ISLE OF MAN, IM 10. Ex Whitney. 1843 Entire to Douglas showing on the reverse a very fine boxed Ramsey/Isle of Man, IM 334. Ex Whitney. 1915 Prisoner of War Postcard to Germany showing a fine ALIENS' DETENTION CAMP/CENSORED/KNOCKALOE I.O.M. oval cachet in Violet. 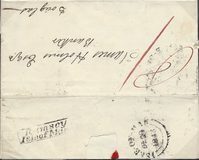 1873 1d Rose-Red, SG 43, Plate 125, STRIP OF THREE, tied to envelope to France by very fine RAMSEY/ISLE OF MAN '036' duplex. 1822 Entire addressed to Stamford showing on the reverse a SUPERB straight line ISLE OF MAN, IM 10, in black. Ex Whitney.